The problem with LiPo battery is that they are not stable when reaching more than 4,x V and going down under 2,xV. This means that you have to use it, basically between 3V and 4,2V. 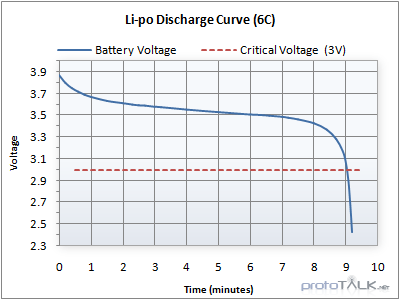 Regarding a typical discharge curve, once you reach 3.3V you have to be really careful as the discharge is really fast. When a LiPo is discharged under 3V you have a high risk to destroy it. As an example, since I missed to charge my fitbit when it asks me to do it and let it discharged to the maximum, my autonomy decreased from 10d to 5days. It means that in your LiPo circuit you have to ensure you will stop to drive energy as soon as the battery level reach 3V. If any have a simple circuit to do this with a 0,1V precision, I’ll appreciate. By the way I’ll give you an integrated solution above. The last thing you can do is monitoring the power voltage and shutdown your circuit before reaching the limit. But you have to ensure that no load will completely discharge the battery even if your system is down. You can choose to buy protected LiPo, these battery have a circuit for over and under voltage protection integrated. The graphic above is a LiPo discharge over 20mAh. On X the available battery capacity, on Y the voltage (read 420 = 4,20V). Regarding the charging process, it is basically easy to manage but you have to ensure to now overcharge the LiPo or it will burn … To avoid this problem, you have a large number of components ; one of the simplest is the Microchip MCP73831T it costs not more than 0,5 euros. This chip will charge and protect the LiPo just using a 5V source. This component is a 5 pin you can solder at home on a SO8-Dip8 adapter eventually. More over you need to regulate the Voltage output from 4V to 3.3V to fit your application. The voltage drop is too little for using a LDO regulator in this role. A solution I used was a diode in series (eventually two) to reduce the circuit voltage. But this solution does not prevent battery over-usage. I was surprise to find only one device managing these two problem in once, ans I assume some other exist, so please, let me know. The solution is a TI component TPS61200. This component provides a regulated output able to be under or higher the LiPo voltage from 1.8V to 5.5V. This component also includes a programmable undervoltage lockout to protect the LiPo. Unfortunately this component have to issues : it’s price (2 euros) and its package really small and as a consequence not easy to hack at home – I experiment and it is hard to put exactly the needed solder ; it can be done only with reflow and if you have no mask I recommend to put solder on the pad instead of the PCB. Once-again, any one that have something better to propose is welcome to comment. Update : After reading your comments, I made a test with a LM3670 ; this component definitely not protecting the lipo against deep discharge. But it have two big advantages : price and form factor. So if you are able to control the discharge and switch your circuit off or really low consumption until user refill it, it can be a good choice. LiPo are given for working up to 60°C and not more. On large LiPo pack you should have see youtube video where the LiPo burn in fire and explosure. For small LiPo I was looking for what is happening when you let them at temperature over 60°C. I do not recommend to execute the same test to anyone, if you use battery at such temperature and do the same kind of test, you do it at your own risk ! By-the-way, for this test I use my heater with a thermometer able to give me a precise temperature at the battery level. In my test I first cook the LiPo at 70-80°C for 5:30. As the battery was not impacted by this test, then I push the temperature up to 85-95°C for 2:30 more. Even if none of these LiPo have burn into a large fire due to over temperature, they have been really impacted, especially for the 500mAh one. It is important to care about the temperature and leave enough space in the casing to allow the battery growth and preserve the packaging. This entry was posted in Hardware and tagged arduino, battery, DiY, IoT. Bookmark the permalink. I expected bi-directionnal communication for long time, today it’s good ! I’m very exited to test this new fontionnality. Is the LM3670 allows a lipo protection against low voltage under 3V ? seems not according to datasheet but as cutting at 2.5V, what is your experience with Lipo lifetime with this chip ? Unfortunately not, but as your telling there is not much component corresponding to this . I’m just starting to work with low-voltage circuits and batteries that can be used. so I can not provide you valuable historical. I think robotic’s web site can be precious to obtain more valuable information. I also watch the new batteries LiFePO4 batteries capabilities and advantages. 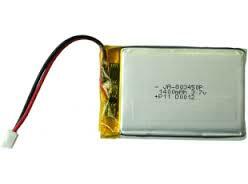 Very interesting article about Lithium-ion and Lithium-Polymer Batteries.